Item description: Baume & Mercier brought out their Formula S range of ‘drivers’ watches in 1989, and this example originates from the first edition. The watch has a polished stainless steel case, along with a wide gold bezel bearing a tachometer scale. 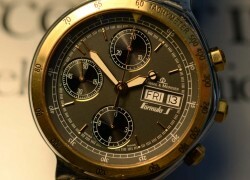 The watch has a clear dark grey dial with three sub-registers in black, and a day / date calender at the 3.0 position. The watch has a screw on case-back milled outer edge, allowing removal with a special tool. Baume & Mercier automatic movement to the inside. The watch still with its original black leather Baume & Mercier strap, and stainless steel Baume & Mercier branded deployment clasp. Condition report: Light use only, virtually unused. Background to Baume & Mercier: Baume & Mercier was founded as Frères Baume in 1830, by brothers Louis-Victor and Célestin Baume. The brothers opened their first workshop in Les Bois, a village in the Swiss Jura. By the late 1800s, the company had an established international reputation, and its timepieces had set accuracy records and won a number of timekeeping competitions. In 1918, company director William Baume partnered with Paul Mercier to found Baume & Mercier in Geneva. The firm became specialized in manufacturing wristwatches, particularly unconventional “shaped” models outside of the traditional round form. In 1919, Baume & Mercier were awarded the Geneva Seal, the highest international distinction of the time for watchmaking excellence. The company expanded internationally by establishing a branch in London in 1921 under the name Baume Brothers, this led to expansion throughout the British Empire. 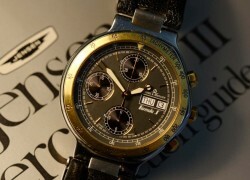 In the 1940s, Baume & Mercier launched a number of modern watch collections, most notably the 2 Register Chronograph. Early examples of this model with the double case backs are now rare and sought after. 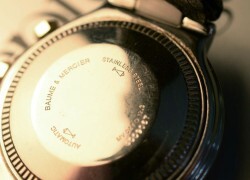 In the 1970s, Baume & Mercier introduced shaped timepieces such as the Galaxie and Stardust models. 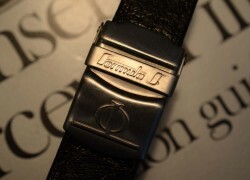 In 1973, Baume & Mercier presented the Riviera, their version of a steel sports watch.